Meeting was called to order at 19:32 with 20 present. We have a quorum. Secretary: There are no minutes to approve. See Joanne to sign in. Corresponding Secretary: Lloyd is not present tonight. Treasurer – Brianna is not present tonight. Julio advised that if you have paid your dues and do not have an ID to please see him. Ryan is not here tonight for the Website. Julio announced that the website will be unavailable for one or two days. He and Ryan are working on it. They will be putting the tech class schedule online and hopefully the class for General. It is also going to include videos. Club Elmer/PIO – Miguel not present tonight. (came in late) Julio advised that at the Hamfest the club received a certificate for 70 years with ARRL. EBC Snowbird Century – David is not here. He needs volunteers for March 26. Please contact David at ke4tin@icloud.com. The 147.000 – Jason said is not working. He’s working on it. The 147.760 – Ray said it’s up and running. The 444.200 – Carl was not present tonight. Julio advised that it works and it now has the right time. 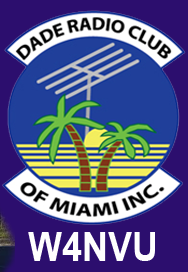 D-Star –Eddie is getting an amp for the VHF side. The 443.125 – Dave advised that the repeater does not work. He put in a new controller and bought another one as a backup. Hope to be up in a week or so. Net Manager – Brandon advised that the nets are still taking place every week. Brandon gave a presentation on the MS 150 Breakaway. He showed the members two videos of Saturday and Sunday. We started at FIU and ended at US1 and Card Sound. We had over 1,000 riders. The weather was bad and had very strong winds. Only one person went to the hospital this time. They brought in just short of $1 million. They do not close donations until the end of the month so that should make their goal. We had help from AMR and they did a great job. Everything was coordinated out of our radio room at the EOC. We had approximately 25 ham volunteers. Julio was net control and did a great job!!! Dave advised that we have 3 new techs tonight from testing. Congratulations!!!! Julio announced for the new hams that he will be giving a tour of our radio room immediately after the meeting. Dave made a motion to adjourn, seconded by Brandon. The DRC meeting was adjourned at 20:11.